Invega (peliperidone) is an antipsychotic medication that has been potentially linked to gynecomastia, male breast growth in children and young adult males. Invega (paliperidone) is a psychotropic agent belonging to the chemical class of benzisoxazole derivatives, and is a dopamine antagonist of the atypical antipsychotic class of medications. It is developed by Janssen Pharmaceutical. Gynecomastia enlargement of a man’s breast tissue due to a hormonal imbalance. This condition causes swelling of glandular breast tissue, noticeably enlarging the breasts. Gynecomastia from Invega use is non life-threatening, but it can be very uncomfortable, embarrassing, may cause permanent psychosocial harm and may require surgery. By September 2012 Johnson Johnson and Janssen Pharmaceuticals faced more than 130 Risperdal and/or Invega lawsuits involving gynecomastia in boys and young men. Many of the lawsuits filed on behalf of young men who were prescribed the powerful antipsychotic medications to treat disruptive behavior disorders and resulted in the growth of breasts in some male patients taking Risperdal and/or Invega. One plaintiff suffered rapid weight gain and growth of 38D sized breasts, and many of the plaintiffs required surgical removal of breast tissue. The lawsuits allege that Janssen was negligent in failing to warn about the potential risk of breast growth. In September 2012, on the first day of trial for a lawsuit involving gynecomastia caused by Risperdal, Johnson Johnson agreed to an undisclosed settlement. Aaron Banks, the 21 year-old plaintiff took Risperdal from the time he was 9 to 13, despite the fact that the drug was not approved for children. He suffered from gynecomastia, male breast growth and required surgery to reduce the size of his breasts. In 2008, six teenage boys have sued and are seeking compensation from JJ after they developed breasts while taking Risperdal. Two of the boys in the lawsuit required mastectomies to get rid of their bosoms. 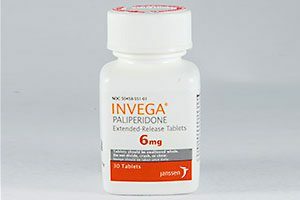 Invega (paliperidone) is an atypical antipsychotic medication used to treat schizophrenia and schizoaffective disorders, but has also be used off-label for other psychiatric disorders. Invega is an extended release formulation of paliperidone that uses the OROS (Osmotic controlled-release oral delivery system) extended release system to allow for once-daily dosing. Paliperidone is the primary active metabolite of the older antipsychotic Risperidal (risperidone). Invega is developed by Janssen Pharmaceutica and was approved in 2006 by the U.S. Food and Drug Administration (FDA) for the treatment of schizophrenia. Unfortunately, Invega can have serious even dangerous side effects, particularly in children. Children and juveniles are especially at risk for severe and rapid weight gain, sudden extreme onset of diabetes, blood disorders, and Tardive Dyskinesia and more pronounced movement disorders. Male children and male juveniles can experience gynocomastia, an enlargement of the breast area a condition that can cause psychosocial disorders. Gynecomastia is the benign enlargement of breast tissue in males due to a hormonal imbalance. It occurs in glandular tissue presenting with swollen breast tissue or breast tenderness, very sensitive, painful, or uncomfortable and is different from fat deposits caused by obesity. This is due to an increase in the production of prolactin a hormone (a condition called hyperprolactinemia), which stimulates the growth of breast tissue and milk production. In females, the increase in prolactin can cause glactorrhea, production of milk. In males, it is gynecomastia an enlargement of male breast tissue. Though gynocomastia is not life threatening, the condition of enlarge breasts in boys and male juveniles can be embarrasing man and cause permanent psychosocial harm. Gynecomastia or male breasts, can have a significantly harmful emotional and mental effect on boys and young men, report mental health physicians, often causing embarrassment, humiliation, mortification, and a deep self-hatred due to the condition. Boys and young men may be severely teased or taunted by their peers, endure humiliating insults and suffer emotional and mental trauma when trying to be a part of normal daily and social activities. Mastectomy: Removal of a large portion of breast tissue and excess skin of the enlarge breast breast. Liposuction: Only effective for mild or moderate cases this procedure removes fatty deposits, there by reducing the size of the breasts. In a Duke psychiatrists research, Risperdal had the strongest link with gynecomastia in children and adolescents of any of the newer antipsychotic drugs–accounting for 70% of the cases analyzed. In girls and young women, the research found that some girls taking Risperdal begin to lactate before they reach puberty. If you or someone you love has experienced Invega Gynecomastia, or other serious Invega side effects, while taking the antipsychotic medication Invega, the Invega Gynecomastia, harmful side effect attorneys at Alonso Krangle LLP would like to talk with you. For a FREE Invega gynecomastia male breast growth lawsuit evaluation, please fill out our online form, or call us.